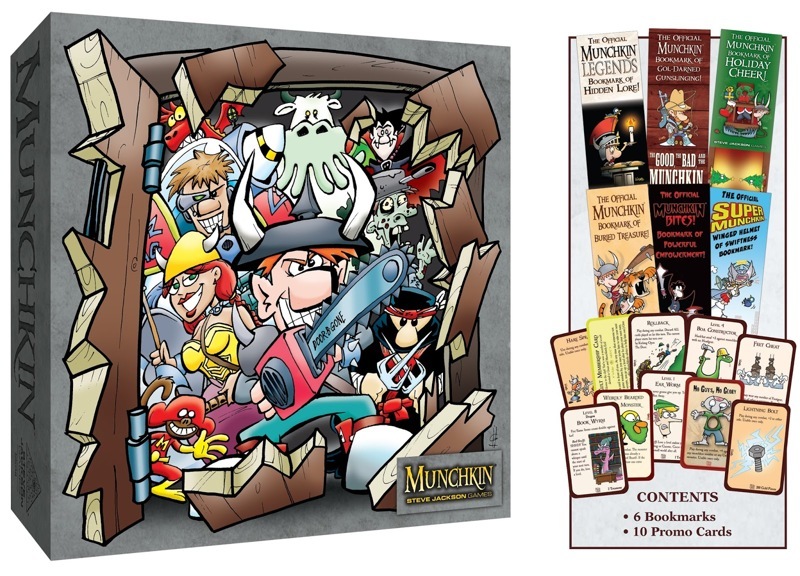 Daily Illuminator: ACD Exclusive Munchkin Monster Box Available Now! May 27, 2016: ACD Exclusive Munchkin Monster Box Available Now! It's alive! The ACD exclusive Munchkin Monster Box variant is available at your friendly local game store now! Store your plethora of Munchkin cards in the only container cool enough to hold them. But it doesn't just hold up to 2,000 cards. It also has room for all of your favorite accessories, like Munchkin D6 and Kill-O-Meters! It's more than a cardboard box: you get a roomy plastic tray with tons of compartments with ample space. Oh, and promos, because it's Munchkin, and everything should have promos. Be the envy of your friends with this king of containers, the top of the line in Munchkin storage! This exclusive Greg Hyland cover is only available from ACD Distribution, and it's out a month before the other designs! You can find it at your FLGS today, or ask your local retailer about ordering it.